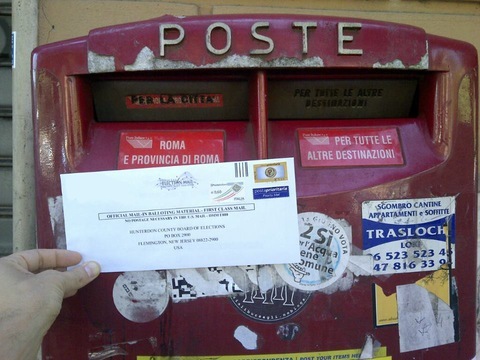 An absentee ballot completed and ready to send home to the U.S. Photo courtesy of the Overseas Vote Foundation. Their numbers rival the populations in some swing states, and they could — in theory — play as critical a role in deciding this year’s narrow presidential race. Yet as the election barrels toward its thrilling finale Tuesday, not much has been said about a potentially key bloc of the U.S. electorate: 4 to 6 million Americans who live and work overseas. That may seem obvious, given the nation’s present glut of domestic concerns, the fact that votes from abroad have little collective sway (each is distributed to the state where the voter is registered) and the reality that expatriates don’t exactly have the greatest track record when it comes to casting their vote (only around 10 percent sent in absentee ballots in 2008). But in neck-and-neck contests such as this one, the overseas vote could prove much more than a numerical afterthought. “If it’s a close state then it could make a difference,” said Michael McDonald, associate professor at George Mason University and an expert on overseas voting. The best evidence for that is the 2000 presidential election, when overseas ballots, particularly from the military, gave George W. Bush a crucial edge in his narrow win over former Vice President Al Gore. And judging by the handful of recent state and congressional races that have been decided by as little as a few hundred votes — the 2008 Maine Senate race was determined by 312 votes; the 2005 Virginia Attorney General’s election came down to 323 votes; and the 2004 Washington governor’s race hinged on just 133 votes — voters overseas are playing an increasingly vital role in elections here at home. “We are seeing a number of close races where the deciding factor is simply who shows up to vote,” said Ada Shen, an American volunteering with Democrats Abroad in Beijing. 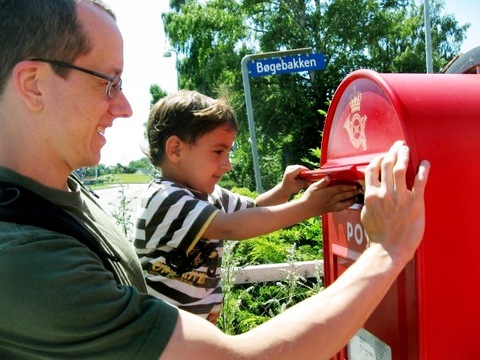 A Danish father enlists a bit of help putting his American wife’s absentee ballot in the mail. Photo courtesy of Overseas Vote Foundation. Both the Obama and Romney camps have acknowledged that trend to some degree by making nods to their patrons abroad — Romney rallied with supporters in Israel when he traveled abroad over the summer and a contingent of overseas Obama backers served as delegates at the Democratic National Convention. But there are those overseas who feel that neither candidate has spent enough time directly addressing them and their specific concerns. Dzieduszycka-Suinat said cumbersome tax laws have handcuffed median income expats in countries with high local taxes as well, and that transferring citizenship to next-of-kin, healthcare and social security benefits and streamlining overseas voting are among the other pressing issues for U.S. citizens abroad. Part of the reason candidates haven’t reached out to overseas voters more, McDonald said, is because there just isn’t much existing data about them. Surveys are costly and logistically complicated, and those that do exist aren’t truly random because they use limited contact lists. It’s even unclear just how many eligible voters abroad there are, McDonald said; the 4 to 6 million range mentioned earlier is based on estimates from the Census Bureau, the State Department and his own research. The portion of those abroad who participate in U.S. elections typically spikes in presidential races, McDonald said, and has grown significantly since the 1970s, when expats without property in the U.S. were first allowed to vote. Technology has much to do with the improved turnout. “Things have definitely gotten better. It used to be that overseas voters felt disenfranchised because it took so long to get the ballots out and get them back. More electronic balloting has really helped,” Stensland Laederich said. 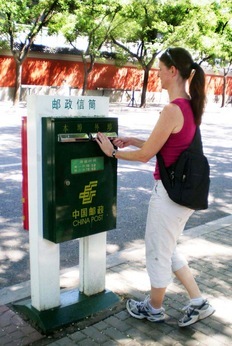 An American woman in China sending her ballot off to the U.S. Photo courtesy of Overseas Vote Foundation. Americans overseas say they can also increasingly see U.S policies impacting the regions where they live. “What happens [in the U.S.] affects the entire world,” Julie Schor, a Democrat in Israel, said. 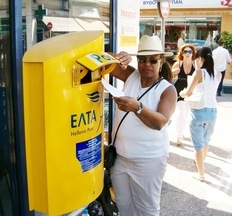 An American woman in Greece with her absentee ballot. Photo courtesy of Overseas Vote Foundation. Still, it’s not yet clear how just how great or influential the overseas vote will be this election. McDonald said there are strong absentee numbers so far in a few states such as North Carolina, but added that may just be the result of an easier voting process that allows Americans in foreign countries to vote sooner than they have in the past.